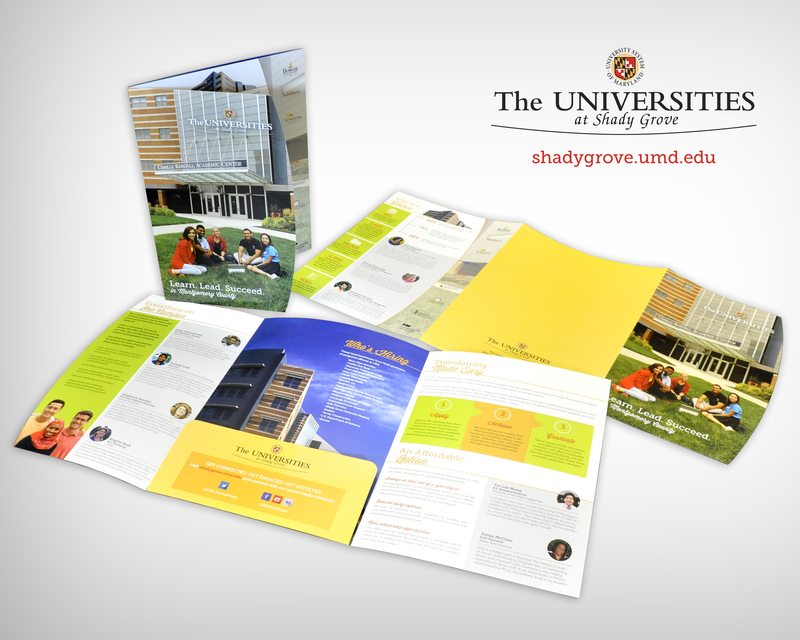 My biggest design project of the Fall semester at The Universities at Shady Grove (USG) was definitely our new recruitment folder. Our marketing team needed to cram as much information into this piece as possible, since USG is a unique campus and also fairly new. As a result, a lot of locals don’t realize that they can earn a bachelor’s degree without leaving Montgomery County. Hopefully they will now! Want to become an Registered Nurse or Pharmacist without driving to Baltimore for class every day? Boom, we have it. Want to major in Hospitality and Tourism Management without relocating to the Eastern Shore? We have that too. There is no such thing as a degree from USG; when you finish your program, you receive your diploma from your home campus (SU, UMD, UMES, et cetera). Another point that we took special care to emphasize in the folder is that much like you would find on a traditional campus, USG offers a library, gym, bookstore, café and an Office of Student Services. The only thing we are missing are the dormitories. A pretty big perk of working here is that they are paying for me to earn my M.S. in Marketing Management from UMUC. USG makes higher education accessible for a lot of people, myself included. The bottom line is: If you want to earn a bachelor’s degree at a beautiful campus with free parking while still getting to live at home and eat your parents’ food, then you should visit USG’s Academics page and check out the USG Recruitment Twitter feed. Click on any of the tiles below to view close-up images of the recruitment folder.